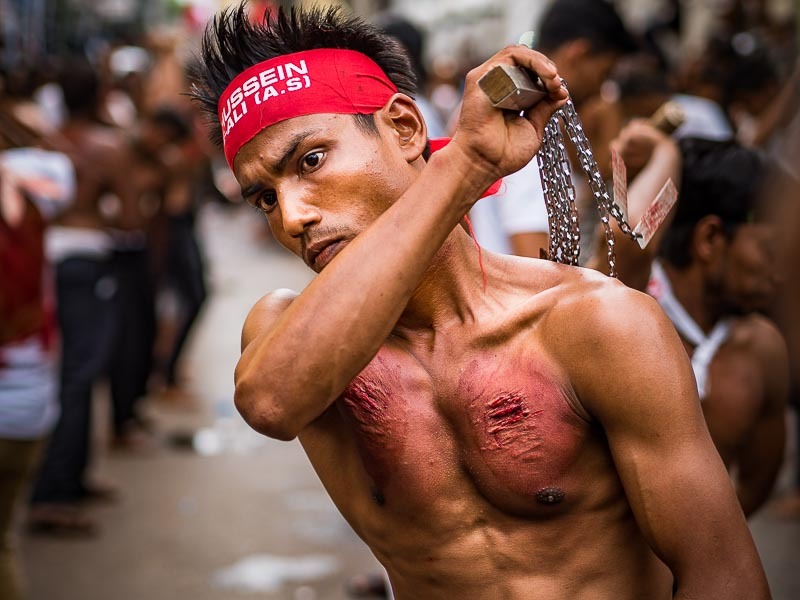 A man participates in a flagellation ritual during Ashura in Yangon. Ashura is the Shia holy day that marks the death of Hussein ibn Ali, the grandson of Muhammad, at the Battle of Karbala in 680 CE. The massacre of Hussein with a small group of his companions and family members had great impact on the religious conscience of Muslims. 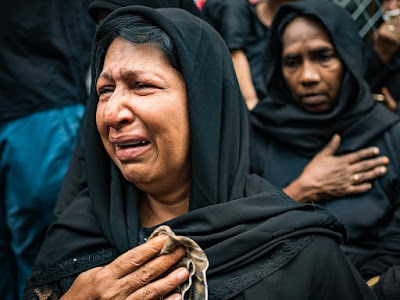 Shia Muslims remember it with sorrow and passion. 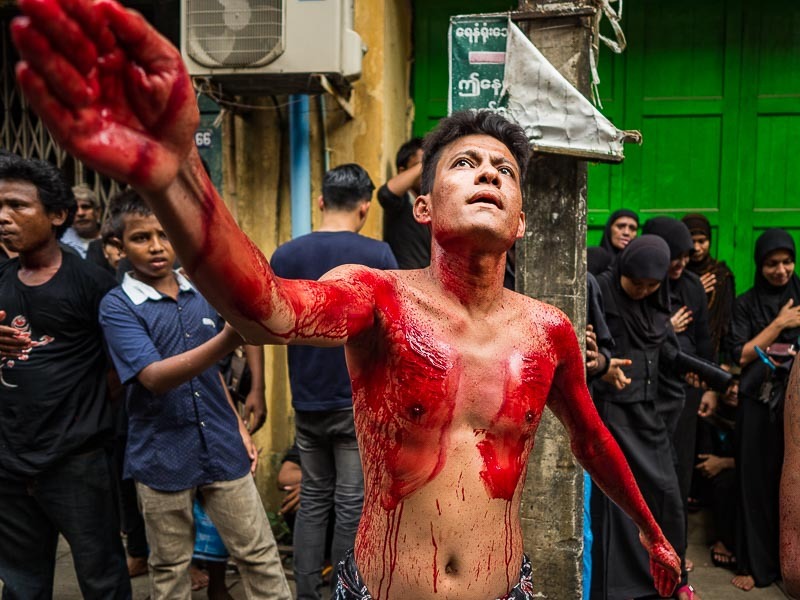 I went to Yangon because most Thai Muslims are Sunni and Ashura is not publicly observed in Bangkok. 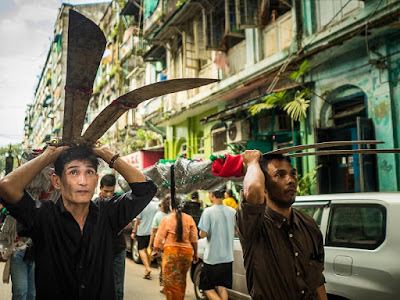 There is a sizeable Shia minority within Myanmar's Muslim minority and Ashura is publicly celebrated in Yangon's Shia community. Women participate in a prayer for Hussein ibn Ali at a Shia mosque in central Yangon. Ashura is best known in the west as the day that Shias participate in flagellation rituals. Processions of men go through the community whipping themselves with chains and knives. 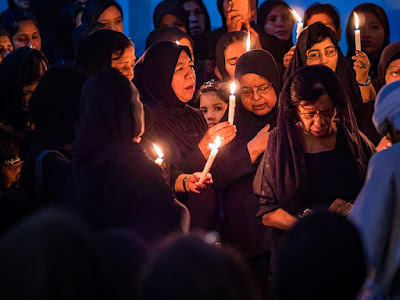 This is the culmination of the holy day, but leading up to the flagellation there are prayers and other religious celebrations. 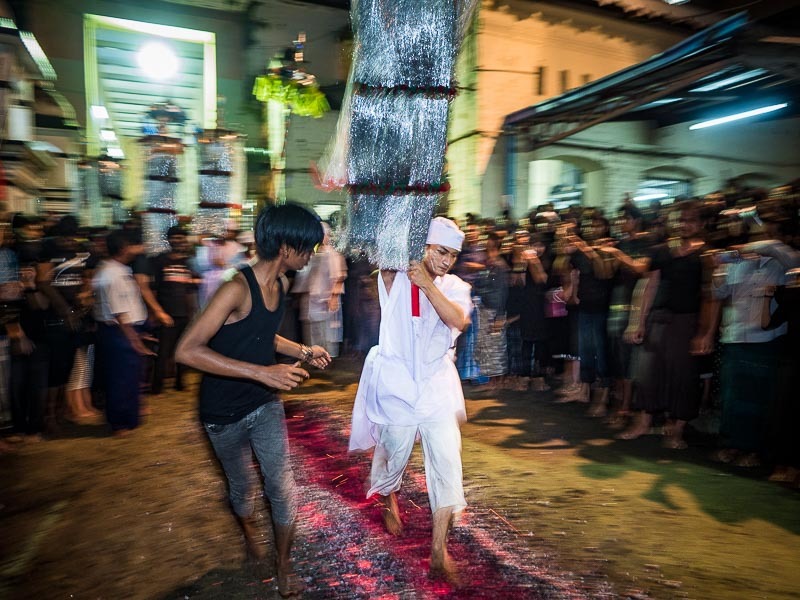 The truth is that although the flagellation rituals are best known, there are a lot of other rituals that go on during the holiday. 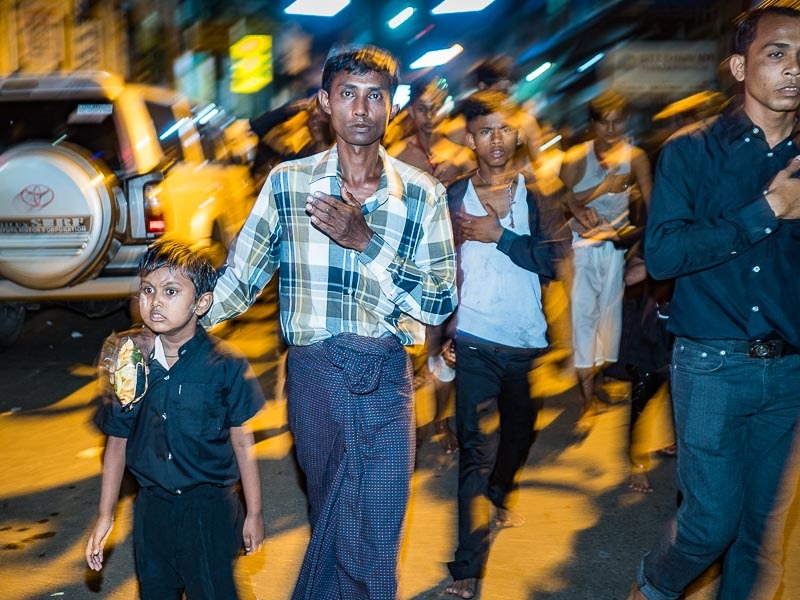 A procession through Yangon on the first night of Ashura. I photographed most of the activities connected to Ashura. The flagellation photos are the most dramatic, but to focus on just the flagellation doesn't give a full view of the holiday. Prayers at a small mosque in Yangon. 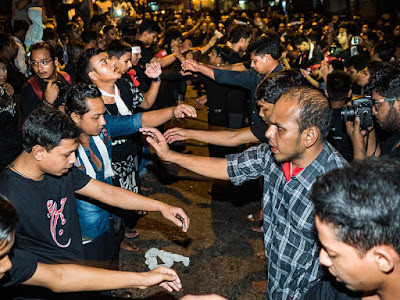 A firewalking ceremony on the first night of Ashura. The flagellation rituals were two days later. My practice when I cover a religious ceremony like Ashura is to show up early and make contacts in the mosque, temple, church etc. That's what I did for Ashura. I went to the mosques the afternoon I got to Yangon, introduced myself and chatted with people. I asked if I could come back to photograph the firewalking and other Ashura celebrations. People said I was welcome to attend as many of the celebrations as I wanted to. Many of the Shia families in Yangon are originally from Iran and India. They've lived in Myanmar for generations and are citizens of Myanmar. Some of them were curious about why I was there. They were used to photographers coming for the last day, for the flagellation rituals, but not for the much quieter processions and prayer services. 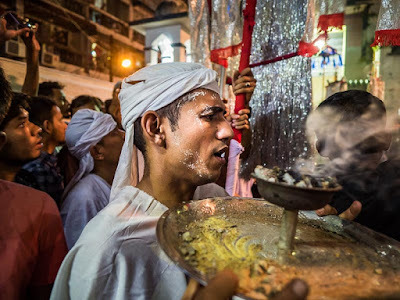 I told them that I wanted to photograph the full Ashura experience, not just the flagellation, which is what most western photographers focus on. At midnight Shia men chanted in the middle of a Yangon street. Ashura is a fascinating holiday. The closest Catholic/Christian holiday I can compare it to is Easter, when some Catholics submit to crucifixion. Shia women weep during a memorial for Hussein. I photographed the flagellation but I think the time spent photographing the other aspects of the holy day present a more accurate picture of it. One of the last pictures I made during Ashura. There are more photos of Ashura in my archive or available from ZUMA Press.